Department of Pharmaceutics 1, College of Pharmaceutical Sciences, Puri - 752002, Odisha, India. Department of Pharmaceutical Technology 2, Jadavpur University, Kolkata - 700032, West Bengal, India. 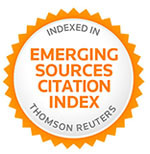 ABSTRACT: The objective of this study is to develop extended release matrix tablet of antihypertensive drug benidipine hydrochloride (BH) and to study its drug release pattern. BH has mean elimination half-life is ~3 h and requires dosing every 4 - 5 h in order to maintain optimal relief and is used orally in the management of hypertension and angina pectoris, but this frequent administration produces side effects like dizziness, headache. So in this study we have achieved to release drug for extended period of time up to more than 18 h for treatment of hypertension, for continuous 24 h control of blood pressure (BP), by taking polymers hydrophilic polymers, hypromellose (hydroxyl propyl methyl cellulose [HPMC] K100M), and polyacrylate polymers, eudragit RL100 and eudragit RS100 and also chitosan (CS) in order to find the suitable formulation. The tablets were prepared by direct compression method and also agglomerative phase of comminution (APOC). In-vitro drug release was carried out under simulated gastric and intestinal condition to achieve drug release. Fourier transform infrared spectroscopy (FTIR) study was performed to study any interaction. Stability studies (40 ºC and 75 ± 5% RH) for 3 months indicated that benidipine hydrochloride (BH) was stable in the matrix tablets. INTRODUCTION: Generally conventional drug formulations which are used in treatment of chronic disorders, has to be administered frequently in multiple dosage regimens, which sometimes creates various undesirable effects. So, in order to avoid or to reduce the effects associated with multiple dosing, controlled or sustained release solid unit dosage forms as tablets were developed 1. The main advantages of this type drug delivery is they shows better patient compliance, maintain uniform drug therapeutic level and increase the safety margin for high potency therapeutic agents 2 by reducing dose as well as their side effects. Now a day’s extended release drug delivery playing an important role by avoiding frequent administration of drug. Out of different extended release system, matrix system is a simple and novel method for modulating drug. The term matrix indicates a three dimensional network composed of drug(s), polymer(s) and other excipients. Because of simplicity; ease in manufacturing and low costs, matrix preparation has become a popular approach. Drugs are usually embedded in hydrophilic or hydrophobic matrices to exert control on their release 3, 4. The principal advantages for getting controlled release dose formulations are to get a more uniform plasma drug profile. In the treatment of hypertension, there are potential advantages to be gained from continuous 24 h control of blood pressure (BP) by developing a sustained release antihypertensive formulation which provide more consistent 24 h BP lowering activity, with attenuation of early morning BP surges and maximal target organ protection. In the present paper BH used as anti-hypertensive drug. One of the most important factors contributing to myocardial ischemia - reperfusion injury is believed to be an overload of intracellular Ca2+, which may arise from a Ca2+ current via Na+–Ca2+ exchange, leakage of Ca2+ from the sarcoplasmic reticulum or mitochondria, release of Ca2+ from Ca2+ binding proteins or Ca2+ influx through Ca2+ channels 5, 6, 7, 8, 9, 10. Numerous attempts have been made to demonstrate the cardio protective effects of Ca2+ antagonists in ischemia–reperfusion injury using animal models. Since the 1980s, it has been reported that Ca2+ antagonists, such as verapamil, nifedipine and diltiazem, protect the myocardium from post-ischemic damage 11, 12, 13 and this reports explained that the Ca2+ antagonists must be administered before ischemia to obtain a cardio protective effect and that administration during reperfusion produces little or no effect 14. The 1, 4-dihydropyridine derivative Ca2+ channel antagonists are widely used as anti-hypertensive or anti-anginal agents by preventing the rapid vasodilatation that produces a reflex increase in sympathetic nerve activity, which in turn results in the cardiac events leading to coronary artery disease 15, 16. Benidipine hydrochloride and manidipine hydrochloride, which belong to 1, 4-dihydropyridine derivative group, have a slow onset and long-lasting effects. Generally for formulating extended release tablet, polymer mixtures are classified into three type’s i.e. first type is combination of non-ionic polymers, second type is combination of non-ionic and anionic polymers and third type is the combination of cationic and anionic polymers e.g., chitosan (CS)– sodium alginate (SA), and CS - xantham gum (XG) 17, 18. The use of polymers in controlling the release of drugs has become important in the formulation of pharmaceuticals. In this present topic study we have taken the polymers like HPMC, polyacrylate polymers (eudragit RL100 and eudragit RS100) and chitosan for preparing extended release matrix tablet of benidipine hydrochloride. Generally, chitosan based poly-electrolyte complexes have been employed as potential carrier materials in drug delivery systems 19. Numerous studies have been reported in literature investigating the hydroxypropyl methylcellulose (HPMC) 20 matrices to control the drug release. Previous studies explained use of different polymer like sodium carboxymethyl cellulose, carbopols, and polyvinyl alcohol, hydrophilic polymers such as HPMC, methylcellulose, which form a gelling network and act as a barrier to retard the drug release mechanism. Generally various grades of HPMC were used to formulate the drug as sustained release doses form. We have not found any research paper by using this combination of polymer for benidipine hydrochloride drug release, so we have prepared number of batches by using this polymer for extending drug release. We formulated a 250 mg tablet containing 12 mg of BH once daily tablet for extending drug release in spite of taking 4 - 6 mg of tablet for 2 to 3 times daily, as frequent administration of drug causes side effects like dizziness, palpitation etc. to the patient and some time poor patient compliance also increase the symptoms of high blood pressure. In hypertensive patients orally treated with maximum dose of 12 mg benidipine causes blood pressure to reduced and this is maintained upto 24 h 23, which indicate that benidipine has long-lasting pharmacological activity 24. Benidipine, also known as KW-3049, is a calcium channel blocker that is used for the treatment of mild to moderate hypertension and angina pectoris. The main objective of the present work was to develop sustained release matrix tablets of water soluble benidipine hydrochloride (BH) using different polymers. Benidipine is stable under varying light conditions and does not decompose when exposed to high moisture or stored at high relative. It is relatively soluble in methanol and ethanol and slightly soluble in water. Materials: BH was procured from Ranbaxy Laboratories, Bangalore. Chitosan (50kDa) and eudragit L100-55 were procured from Merck Chemicals Ltd., Germany. Other ingredients like HPMC, MCC, Lactose, Aerosol (Colloidal Silicon Dioxide) and Glecyryl Behenate from Degussa India Pvt., Ltd., and magnesium stearate were procured from S.D. Fine chemicals, Mumbai. Preparation of Matrix Tablets: Manufacture of matrix tablets by direct compression method involves mainly three steps. 1. Sifting: Accurately weighed quantity of drug and excipients were passed through sieve no. 20 and 40 respectively. 2. Blending: Drug and excipients (excluding lubricant) were blended thoroughly for 15 min. After the sufficient mixing of drug as well as other components, magnesium stearate were added and further mixed for additional 2 - 3 min. 3. Compression: The blend was mixed and was compressed in 10 mm punch tablet machine karnavati tablet press punching machine, the weight of tablets was kept constant for tablets of all batches, which was 250 mg. We have prepared as many batches and after proper analysis of all batches the following batches were selected for further study. The composition was given in Table 1. The tablets were round and flat with a thickness of 3.1 ± 0.2 mm. Scanning of Drug in Phosphate Buffer: The solution containing 30 µg/ml of benidipine hydrochloride in phosphate buffer was prepared and scanned over range of 200 nm to 400 nm against blank using double bean UV spectro-phometer. Compressibility Studies: The different pre-formulation parameters are studied like angle of repose, compressibility index and hausners ratio. Fourier Transform Infrared Spectroscopy (FTIR) Studies: FTIR studies of formulation along with pure drug (BH) were carried out at room temperature by FTIR spectrophotometer using KBr pellet. All the spectra were recorded in the range of 400-4000 cm-1. Post-compressional Parameters of All Formulations: Hardness: Method: Hardness was measured using Pfizer hardness tester. For each batch 3 tablets were tested. Observation: The % friability we found in the range between 0.5 to 1%. Method: Twenty tablets were randomly selected from each batch and individually weighed. The average weight and standard deviation of 20 tablets was calculated. The batch passes the test for weight variation test if not more the two of the individual tablet weight deviate from the average weight by more than the percentage shown in table and none deviate by more than twice the percentage shown. Results shown in Table 2. In-vitro Dissolution Studies: In-vitro dissolution studies were carried out by using USP type II apparatus dissolution apparatus using phosphate buffer pH 6.8 as dissolution medium. The tablets were submerged into 900 ml of simulated gastric fluid (SGF: hydrochloric acid solution, pH 1.2) for 2 h, then the tablets were transferred to 900 ml of simulated intestinal fluid of phosphate buffer, pH 6.8. This method was used to simulate the situation of a tablet's transit through the gastrointestinal tract. The 10 ml of sample was withdrawn at predetermined time interval and same volume of fresh medium was replaced. The samples were analyzed for drug content at wavelength of 357 nm using double beam UV visible spectrophotometer. The content of drug was calculated using the equation generated from standard curve. The % drug release was calculated. Spectrophotometric Characterization: λmax was found to be at 357 nm. Micromeritic Properties of Powder Blend: The angle of repose of the all the formulations were determined and the values ranged from 25.3º to 33.40º indicate excellent flow properties of granules and it was observed to be within the Pharmacopoeia limits. The Carr’s index values ranged from 8.05 to 15.03% indicates excellent and good flow properties. Hausners ratio values ranged from 1.07 to 1.17 indicating good flow. It means that the flow properties of granules were found to be within the Pharmacopoeia limits. Results are shown in Table 3. In-vitro Drug Release Studies: We have prepared number of batches to prepare 250 mg of benidipine hydrochloride tablet and for explanation point of view we have selected most suitable batches in order to extend drug release. The drug release pattern is shown in Fig. 1. In formulation F1 amount of HPMC along with eudragit RS100 causes the drug release i.e. about 40 - 50% drug is released within 5 h, but as time precedes swelling of polymer makes the tablet to extend drug release and it was observed 99% of drug releases within 15 h. On exposure to water or biological fluid, generally the dry polymer becomes hydrated, swells and forms a gel barrier layer, which retards the diffusion of drug out of the matrix 25. In formulation F2, we have taken HPMC along with eudragit RL100 polymer and we found drug release is very rapid with 99% release in 9 h which is may be due to higher permeability of eudragit RL 100 in medium making higher % of drug release. So we may conclude eudragit RS100 extended drug release for more time as compared to formulations containing eudragit RL100 and various research studies also indicated that formulations having eudragit RS100 prolonged drug release as compared to formulations based on eudragit RL 100. In formulation F3 release extends up to more than 17 h which may be due to poly electrolyte complex between eudragit RL100 and CS 26 and also HPMC makes the tablet swell and extended drug release. In order to check the effect of HPMC on drug release we have taken HPMC100M in formulation F4 and found all drug releases within 15 h. Generally when a tablet is placed in the dissolution media, wetting of the surface occurs first, followed by hydration causing the formation of pores due to dissolve of the excipients by increasing its porosity strength by which it increases entry of the liquid through the microscopic pores. But when polymer is added to formulation, polymer content block microscopic pores, leading to reduced drug release rate, due to the formation of a thick and turbid gel, which is resistant to erosion and diffusion. In formulation F4 though drug release extends to considerable period of time, but the tablet of this batch possess less crushing strength causing tablet to disintegrate easily which may be due to higher chitosan concentration which acts as tablet disintegrant in this batch 27, 28, 29. Formulation F5 contain HPMC polymer along with eudragit RS 100. When we studied the drug release we found tablets of this batch shows extended of drug release due to swelling of HPMC polymer and release pattern may extend more than 18 h. Another reason for extended drug release may be due to presence of lactose in this formulation, which is a water-soluble excipients, it increases the hydration rate and relaxation of the polymer chains, resulting in slow release of drug by diffusion from the matrix tablet layer 30. So in formulation F5 more than 50% drug release within 5 h, but in Formulation F3, presence of MCC causes less disentanglement or more binding occurs which leads to less % drug release is less in that period of time. In Formulation F6 though HPMC K 100M release drug slowly for longer period of time drug release is not uniform and within 6 h the tablet releases drug which may be due to higher concentration of chitosan and also lactose also causes erosion of tablet. 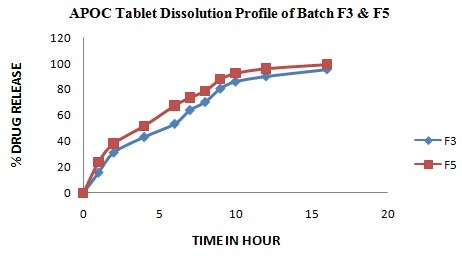 So the tablets of F6 batch release drug for shorter period of time in comparison to F4 batch tablet. 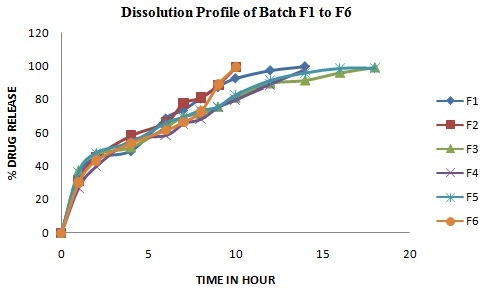 Dissolution profiles of all the batches are shown in Fig. 1. In the current study we found formulation F3 and F5 due to their similar drug release pattern for extended period of time selected as suitable batch. So in order to select the best formulation in between F3 and F5, we prepared tablet in a novel laboratory technique APOC (agglomerative phase of comminution) method to study which batch has more drug release. Generally, APOC granulation method is one of the recent techniques used in powder granulation technology which has a major role in improving the aqueous Solubility of BCS class II drug. The drug along with HPMC along with other polymer and micro crystalline cellulose (For F3 batch) and lactose (For F5 batch) were weighed accurately and pass through ball mill at the constant speed of 50 rpm which ball mill consisting of different size of balls for 6 - 12 h to form the agglomerate of fine cohesive particles. These milled powders are weighed according to formulation weight and mixed with aerosol (Colloidal Silicon Dioxide)and glyceryl behenate and pressed in tablet punching machine. When we studied the dissolution of two batches F3 and F5 prepared by the APOC technique, we found dissolution is higher in F5 and this prepared tablet also increases % drug release time to more than 18 h which may be due to granules formed by this ‘prolonged grinding method’, causes particle size changes, but when we studied the F3 batch tablet, the presence of high concentration of chitosan on tablet might increase its hardness during grinding process and indicate high resistance to abrasion, thereby decreasing % drug release and so not selected for optimization and stability. So we may conclude APOC technique makes the formulation stable and by this method binder less tablets 32 may be prepared using this method, by simplifying tablet formulation and enhancing stability. A possible mechanism for the increased dissolution rate is the increased internal surface area of the granules produced by the prolonged grinding methods. Results are shown in Fig. 1 and 2. Water Uptake and Erosion Studies: The uptake of water by tablets is a crucial step for to study swelling and erosion of the polymer matrix. Water uptake and erosion were studied and the following equations were used to determine the percent weight gain or water uptake, and the percent mass loss or erosion 33, 34. Generally polymer dissolution and erosion take place in three steps: Solvent penetration into the polymer matrix, polymer swelling and chain disentanglement and attainment of the threshold disentanglement. When water penetrates into the polymer matrix, it enhances the mobility of the polymer chains which eventually disentangle at the advancing front, separating the gel layer from the erosion/dissolution front. During our study though HPMC K 100M increases swelling but we found presence of lactose in F5 makes the tablet erode early in comparison to F3 batch tablet which contain MCC. So we may conclude polymers which show better swelling as well as erosion properties are good candidates for low solubility drug. Drug Release Kinetics and Transport Mechanism: To know the drug release kinetics from these formulations, the dissolution data were subjected to different kinetic model such as zero order, first order and higuchi’s equation. The Ritgere Peppas equation was applied equation was used to characterize drug release mechanism from the polymeric system i.e. Where the Mt/M1≤ 0.6 data are used for calculation, k is a constant incorporating structural and geometric characteristics of the dosage form, n is the release exponent, which depends on the release mechanism and shape of the matrix tested and t is the release time. Exponent n for polymeric controlled delivery systems of cylindrical geometry has values of n < 0.45 for Fickian diffusion, 0.45 < n < 0.89 for anomalous (non-Fickian) transport i.e. drug release was controlled by a coupled Fickian diffusion-polymer relaxation mechanisms or Fickian diffusion-erosion mechanisms resulting from swelling behaviour of polymers. Results are shown in Table 4. From the above observations the tablet showed the Higuchi square root model R2 values for batch F5 (r2 = 0.998) indicates that the drug released by diffusion and slope of Ritger-Pappas plot is 0.720 indicates that diffusion-erosion mechanisms resulting from swelling behaviour of polymers. FTIR Study: FTIR studies of the pure drug (BH) and the formulation (F5) were carried out to study the interaction between drug and excipients in the formulation. Benidipine hydrochloride is a dihydro-pyridine group derivative showing peaks in the following wavelength region 3066 (aromatic C-H group), 2945 (CH3-CH2 group), 2519 (NH2), 1661 (C=O), 1533 (NO2), 1491 (C=C), 1348 (NO2), 1098, 700 cm‐1. 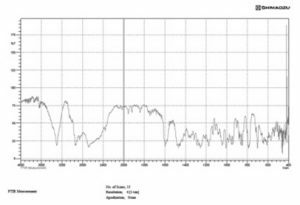 Similarly HPMC shows the peaks in wavelength region like 2900 due to methyl and hydroxypropyl group, 2530 hydroxyl group, 1650, 1400, 1343 cyclic anhydrides, 1100cm‐1 due to ethereal C-O-C group. When we have studied the FTIR of most suitable batch i.e. 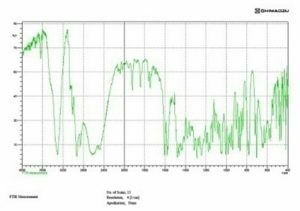 F5, we have not found any sharp or any intense peak as shown in Fig. 4 of F5, which indicating there is no chemical interaction between drug and the polymers and excipients used in formulations as shown in Fig. 3 and Fig. 4. However, though some additional peaks were observed in IR study of this batch, but it is explained presence of polymers in matrix-type films are compatible with a number of drugs 35. 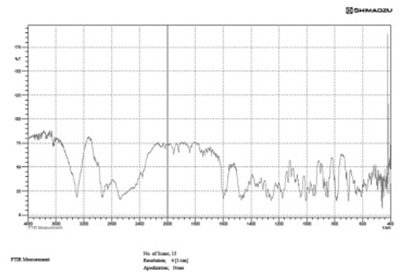 FTIR spectra are as shown in Fig. 3 and 4. Stability Studies: During our study we found batch F5 was the most suitable batch, so stability study was carried out for this batch at accelerated condition of 40 ºC and 75% Rh condition for period of 3 month. After each month tablet sample was analyzed for the in-vitro drug release study and the results are shown in Table 5. RESULTS AND DISCUSSION: From the stability study of selected batch F5 and by studying the drug release pattern of this batch, we found the tablets are stable at 4 ºC and 75% Rh without showing any significant change. CONCLUSION: In this research finding we found antihypertensive therapy should be based on achieving consistent blood pressure control over a full 24 h period, which is possible by selecting a sustained release formulation of a drug. So the said drug BH can extend drug release up to more than 18 h. The present investigation shows that hypromellose (HPMC K 100M) at suitable concentration combined with polyacrylate polymers can be used effectively to modify the release rates in matrix tablets. Result shows eudragit RS100 produced better sustained release pattern compared to eudragit RL100 based formulation in some batch, but the combination EL and Cs extended drug release more time in comparison to other formulation due to IPEC formulation as in F4. The physiochemical characterizations of all prepared formulations were found to be satisfactory and various evaluation parameters like angle of repose, bulk density, tapped density, hausners ratio, hardness, friability, weight variation and drug content of the formulations were found to be satisfactory. The kinetic treatment of the drug release data of the optimized formulation (F5) was done. On comparing equation of line and regression coefficient (R2) for different models it was found that the optimized formulation F5 follows higuchi model. It was indicated that the drug release was diffusion controlled and directly proportional to square root of time. The selected batch F5 stability studies were carried out for period of 3 months as per ICH guidelines and results shows it is in acceptable limits. So in conclusion we may say that in the treatment of hypertension, there are potential advantages to be gained from continuous 24 h control of blood pressure (BP) by preparing BH sustained release formulation. ACKNOWLEDGEMENT: The authors thankful to college of pharmaceutical sciences for carrying out the research work. Ray D and Prusty A: Designing and in-vitro studies of gastric floating tablets of tramadol Hydrochloride. Int J App Pharm 2010; 2(4): 12-16. Brazel CS and Peppas NA: Temperature and pH sensitive hydrogels for controlled release of antithrombotic agents. Mater Res Soc Symp Proc 1994; 331: 211-6. Kydonieus A and Dekker M: Treatise on controlled drug delivery - fundamentals, optimisation - applications. Polymer International 1995; 36(4): 374. Wise LD: Handbook of pharmaceutical controlled release technology, Marcel Dekker, Inc. New York, Basel 2000. Lazdunski M, Frelin C and Vibne P: The sodium/hydrogen exchange system in cardiac cells: Its biochemical and pharmacological properties and its role in regulating internal concentrations of sodium and internal pH. J Mol Cell Cardiol 1985; 17: 1029-1042. Mahnensmith RL and Aronson PS: The plasma membrane sodium hydrogen exchanger and its role in physiological and pathophysiological processes. Circ Res 1985; 57: 773-788. Seki S, Taniguchi M, Takeda H, Nagai M, Taniguchi I and Mochizuki S: Inhibition by KB-R7943 of the reverse mode of the Na+/Ca2+ exchanger reduces Ca2+ overload in ischemic-reperfused rat hearts. Circ J 2002; 66: 390-396. Tani M, Asakura Y, Hasegawa H, Shinmura K, Ebihara Y and Nakamura Y: Effect of preconditioning on ryanodine-sensitive Ca2+ release from sarcoplasmic reticulum of rat heart. Am J Physiol 1996; 271: H876-H881. Jahangir A, Ozcan C, Holmuhamedo EL and Terzic A: Increased calcium vulnerability of senescent cardiac mitochondria: Protective role for a mitochondrial potassium channel opener. Mech Ageing Dev 2001; 122: 1073-1086. Borgers M, Thone F, Van Reempts J and Verheyen F: The role of calcium in cellular dysfunction. Am J Emerg Med 1983; 1: 154-161. Nayler WG, Grau A and Slade A: A protective effect of verapamil on hypoxic heart muscle. Cardiovasc Res 1976; 10: 650-662. Weintraub WS, Hattori S, Agarwal JB, Bodenheimer MM, Banka VS and Helfant RH: The effects of nifedipine on myocardial blood flow and contraction during ischemia in the dog. Circulation 1982; 65: 49-53. Bush LR, Li YP, Shlafer M, Jolly SR and Lucchesi BR: Protective effects of diltiazem during myocardial ischemia in isolated cat hearts. J Pharmacol Exp Ther 1981; 218: 653-661. Kloner RA and Braunwald E: Effects of calcium antagonists on infracting myocardium. Am J Cardiol 1987; 59: B84-B94. Hoshide S, Kario K, Mitsuhashi T, Ikeda U and Shimada K: Is there any difference between intermediate-acting and long-acting calcium antagonists in diurnal blood pressure and autonomic nervous activity in hypertensive coronary artery disease patients? Hypertens Res. 2000; 23: 7-14. Scholz H: Pharmacological aspects of calcium channel blockers. Cardiovasc Drugs Ther 1997; 10 (S3): 869-872. Gohel MC, Parikh RK, Nagori SA and Jena DG: Fabrication of modified release tablet formulation of metoprolol succinate using hydroxypropyl methylcellulose and xanthan gum. AAPS Phar. Sci Tech 2009; 10(1): 62-8. Samani SM, Montaseri H and Kazemi A: The effect of polymer blends on release profiles of diclofenac sodium from matrices. Eur. J Pharm Biophar. 2003; 55(3): 351-5. Nair A, Gupta R and Vasanti S: In vitro controlled release of alfuzosin hydrochloride using HPMC-sbased matrix tablets and its comparison with marketed product. Pharm Dev Technol 2007; 12: 621-625. Gohel MC, Patel TP and Bariya SH: Studies in preparation and evaluation of pH-independent sustained-release matrix tablets of verapamil HCl using directly compressible Eudragits®. Pharm Dev Technol. 2003; 8: 323-333. Takka S, Rajbhandari S and Sakr A: Effect of anionic polymers on the release of propranolol hydrochloride from matrix tablets. Eur J Pharm Biopharm. 2001; 52: 75-82. Noda H, Saito Y and Fujita T: The antihypertensive effect and pharmacokinetics after single oral administration of Benidipine hydrochloride in patients with essential hypertension. Jpn Pharmacol Ther. 1990; 18: S703-S711. Kobayashi H and Kobayashi S: Relationship between plasma concentration and antihypertensive effect of the dihydropyridine calcium antagonist, benidipine, in rats. J Pharm Pharmacol. 1997; 49: 1200-1204. Wan LSC, Heng PWS and Wong LF: Matrix swelling: a simple model describing extent of swelling of HPMC matrices. Int. J. Pharm. 1995; 116, 159-168. Mustafin RI, Protasova AA, Van den Mooter G and Kemenova VA: Diffusion transport in Interpolyelectrolyte matrix systems based on chitosan and eudragit L100. 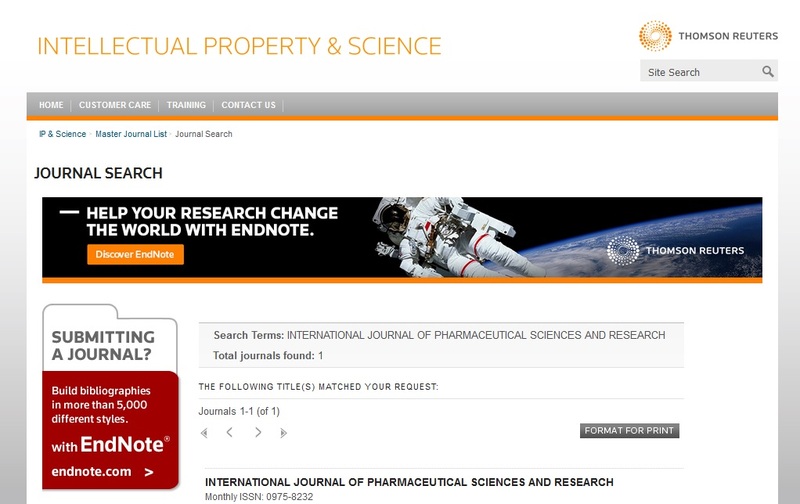 Pharmaceutical Chemistry Journal 2005; 39(12): 663-666. Aulton ME: Pharmaceutics the Science of Dosage Form Design. Churchill Livingstone, Edinburgh 2002; 2: 404-410. Ritthidej CG, Sunibond PC and Menasveta P: Chitin and chitosan as disintegrants in paracetamol tablets drug development and industrial pharmacy 1994; 20(13): 159-168. Kenneth OC: Formulation development and evaluation of drug release kinetics from colon-targeted ibuprofen tablets based on eudragit RL 100- Chit ISRN Pharm 2013; 838403. Bendgude TN: The effects of lactose, microcrystalline cellulose and dicalcium phosphate on swelling and erosion of compressed HPMC matrix tablets: Texture Analyzer. Iran J Pharm Res. 2010; 9(4): 349-358. Ho T and Hersey AJ: Compactibility of granules prepared by a novel method of granulation and their dissolution. J. Pharm. Pharmacol. 1980; 32: 160-166. Reynolds TD, Gehrke SH, Hussain AS and Shenouda LS: Polymer erosion and drug release characterization of hydroxy propyl methyl cellulose matrices. J. Pharm. Sci. 1998; 87: 1115-1123. Rinaki E, Valsami G and Macheras P: The power law can describe the “entire” drug release curve from HPMC based matrix tablets: a hypothesis. Int. J. Pharm. 2003; 255: 199-207. Wade A, Weller PJ and DC: American Pharmaceutical Publishing Assoc, Washington, Hand book of pharma-ceutical excipients 2000; 250-55, 401-6. Prusty A, Mishra AK and Gupta BK: Effect of polymer in release profile of extended release matrix tablet of anti-hypertensive drug & to study impact of agglomerative phase of comminution (APOC) method on drug release. Int J Pharm Sci & Res 2018; 9(10): 4158-65. doi: 10.13040/IJPSR.0975-8232.9(10).4158-65. Authors Address: Department of Pharmaceutics, College of Pharmaceutical Sciences, Puri, Odisha, India.